Before obtaining a MS in Architecture from Illinois Institute of Technology as a student of architect Mies van der Rohe and planner Ludwig Hilberseimer, Seidel worked as a farmhand, factory worker, Alaska salmon fisherman, and carpenter. 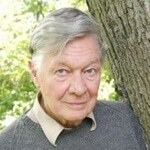 In 1957, while working in Chicago on the most environmentally damaging office and institutional buildings, he read a book entitled “The Challenge of Man’s Future,” by Harrison Brown. It described the dangers of excessive population growth, food and mineral shortages, and over consumption that threatened our future. It was clear his work bore a heavy impact on these problems, he changed direction and became a committed environmental architect planner. During this period, and after, he spent time teaching at five tuitions of higher learning including one in China and one in India. His work at the University of Michigan on directing urban expansion into a system of pedestrian oriented new towns led to his being hired as the master planner for an environmentally sound socially integrated community of 80,000 to be built outside of Cincinnati. When this failed to materialize, he took to developing, designing, and building eco-friendly, urban infill condominiums in Cincinnati. When Ronald Reagan became president, and the Arab oil boycott was call off, public interest in conservation evaporated. It was clear that his efforts, and those of others, were directed toward a dead end. A question kept haunting him: “When we see that our future is threatened and we know what we can do about it, why don’t we act?” Thinking about this led to another abrupt change in his career. He turned to writing. After failing to obtain production funding for a television documentary, “Invisible Walls” addressed to this problem, in 1998 “Invisible walls” came out as a book . Since then Seidel has devoted his time producing books and articles, related to examining this problem of inaction. Caryn Hartglass: Hello, good afternoon, I’m Caryn Hartglass and you are listening to It’s All About Food. It’s April 18, 2012, and we have a lot of work to do. 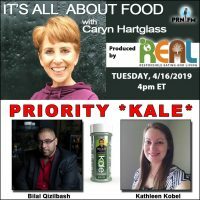 You know on this show I try to connect the dots between our food choices and, really, all life on Earth; the life of humans, our personal health, the health of our families, the life of other animals on the planet and the life of the planet itself. There are so many things that are involved with the food we eat, each bite has a story, almost. And yet, there’s a bigger picture, and we are going to be talking about that today. I really am looking forward to this conversation. I’m going to invite my guest Peter Seidel who’s the author of a book I just finished reading, Invisible Walls: Why We Ignore the Damage We Inflict on the Planet and Ourselves. He’s an environmental architect and planner who studied with world-renowned Miles van der Rohe and Ludwig Hilberseimer, both of the Bauhaus in Germany. Welcome to It’s All About Food, Peter! Peter Seidel: Thank you! Thank you, I’m glad to be with you. Caryn Hartglass: I don’t believe in coincidences, and I found this book which actually came out in 1998, and I’m always looking for interesting topics and things to kind of connect the dots for me in terms of how to make this world a better place, and I was looking over at Prometheus books and found your book and read it and… good! Sometimes the world seems so overwhelming, and there are so many things that need to be done, but the first step is just to put it all down on paper. And I’m really glad that you gave us this guidebook on what we need to do. I’m wondering how you got to write Invisible Walls. What was the motivation that caused you to put all of this information in a book? Peter Seidel: Well, I had been… I was originally an architect, I suppose doing the worst of all the kinds of things environmentally. I worked on the Air Force Academy and all-glass office buildings and things like that for the leading firm at that time, and somebody gave me a book called The Challenge of Man’s Future, and it was about world population and resources and so on. That startled me, and I thought, Oh my gosh! So, I had to remake my life, and I started teaching, and then, through that, I developed some system of building new towns, and I got a job to design a series of new towns down here in Cincinnati, or one new town. It was going to be for 60,000 to 80,000 people. Unfortunately, it fell through. At that time, then there was a real developing interest in environmental architecture, solar energy, energy conservation… So, I fit right into that and I was doing things here and developing projects here on that. Then, all of a sudden, it happened when Ronald Reagan became president. He ripped the solar collectors off the White House and efforts to conserve energy and all that went out the window and I sat and thought, My gosh, here… trying to do this doesn’t make any sense. Why? Why is it we know all of these things that are so wrong and that are happening… why do we now just disregard all of this? And, I’m thinking about that, well it ended up with a book. Caryn Hartglass: Mm-hm. Well, it’s a good one. That Ronald Reagan era, a lot of people point to it as a real turning point in our society and not necessarily a good one, although he has a great many fans that loved him as the president. I was never one of his fans, and there are a lot of things that he put into place that have had such detrimental effects on our society, and we are really just realizing them now. But I didn’t know that he ripped the solar panels off. I can’t believe that. Peter Seidel: He did. Carter put solar panels on the White House, and he was trying to do what he could to conserve energy and make more fuel-efficient cars. And all that… out the window it went. Caryn Hartglass: I don’t like to look back too often, because I want to keep moving forward, but we can, if we want to, learn things from the past. I think, gosh, what a world we could have had today if we had started in the Carter/Reagan time period of really trying to become energy-independent and moving forward with solar energy and other energy, oil-free alternatives. Peter Seidel: It would all different. Caryn Hartglass: It would be! It would be such a beautiful place. Okay, but I’m going to hold back my tears, and I’m going to take a deep breath, whatever kind of air I’m breathing right now and try and get enough oxygen out of it. I want to talk about the beginning of the book where you talk about the limitations of our brain, because it really helped me feel better to understand at least why we do some of the awful things that we do. Peter Seidel: We have to understand this. We have to learn what our… where are problems are within ourselves. This is absolutely essential, if we’re going to overcome these problems, we have to understand where they are within us, because it’s from us all these problems evolve. [Caryn: Right.] We can’t point to “them.” It’s actually… these are things in all of us, the way we’re constructed, the way we’re made. Caryn Hartglass: It makes me feel a little better understanding and understanding the weaknesses. On the other hand, as we get later on into the book, it gets a little scary to realize that we all have the potential to do great good and we also could turn in the opposite direction and just do horrific things, and it’s within all of us. Caryn Hartglass: Oh, that’s chilling! Peter Seidel: Well, the chilling part is… well I’ve just gone over all of this and then when I got to the point where I made suggestions: well, these are the problems; here’s what we should do, and I started reading about that, and then I began to really get startled. All these suggestions… are no place; we’re worse off now than we were then. Caryn Hartglass: Yeah. There are so many things I want to talk about. Can you just talk about in our brain this filtering that we do that is so helpful and yet limiting? Peter Seidel: Well, filtering is… there’s a psychologist and he says that we take in about one trillionth of what’s going on around us. When you think about what’s going on around us there’s as far as electromagnetic waves. There’s a vast spectrum of them, and our eyes only take in a little piece of this, and we are not very good at smells. We are not very good at many, many things, so we just take in a tiny portion of this. Of what we take in, we can’t remember it all either, and, of course, a lot of it doesn’t make sense to us in our brain. Our brain has to… we have to deal with things that our brain will make sense of and be able to do something with. And then, when it does that, there is still so much information out there that we would get totally confused by it unless we filter out and pick out things to pay attention to and remember. So, of all the things that are going on out there, around us, only a little bit of it draws our attention and gets remembered. Caryn Hartglass: It’s fascinating thinking about it, because we perceive… we have this idea of what the world is and we really have no idea what the world is really about; we perceive so little of it. Peter Seidel: Yeah. We do perceive a little bit of it, but, of course, it’s in our viewpoint. An interesting thing: the world as we see it is totally different than what the world really is. For instance, the world has no color, at all. Peter Seidel: The color comes from different wavelengths that are reflected off of objects, and these wavelengths come into our eyes, and then different wavelengths get transferred into different meanings to us, and that’s colors. So all of a sudden these things that had no colors begin to have, which is all inside our heads, where these colors occur. Caryn Hartglass: That’s just starting off all kinds of other things that I don’t even know if I want to go there, but I’m thinking about those people who are colorblind who might feel stigmatized that they’re colorblind, but actually they’ve got their own unique way of seeing the world. Peter Seidel: Yeah, and they are just a little bit more colorblind than the rest of us. Peter Seidel: The color of course is in one sense an illusion, and in another sense it’s not, because the colors represent different wavelengths. Caryn Hartglass: Ok, this is all really interesting. Then the other part of the filtering thing helped me understand why it’s so difficult to communicate, even with the people that we know, because we’re all taking in information; we’re not remembering every word that everyone is saying to us, and we’re kind of interpreting it, and that’s what we are remembering, our interpretation. And that can lead to a lot of misleading information. Peter Seidel: It does. It does. We all build up… the world we think we see is really a world inside our minds. We each build up in our minds a model of the world, and we interact with that model that’s in our minds. This can be, of course, different for different people. So, of course, when you have one model in your model and another person sees something different, then there is a communication problem, sure. Caryn Hartglass: Ok, so we’re dealing with our limited brains, and as a result, we make all kinds of decisions and obviously many of the decisions today are not the best ones that we could make for ourselves and for the future of the planet. Peter Seidel: I’m afraid not. Caryn Hartglass: But we do have hope, right? Now, you wrote this book in 1998, and I think that most of the information in here, if not all of it, is very fresh and very applicable to what’s going on today. The only thing that’s missing in here is, so here we are, what is it, like 14 years later, and we now have the internet, and we have social networking. I think that’s just exaggerated a lot of the things that you talk about in your book. Peter Seidel: It’s opening up a whole world, a whole space of some things that are very different that I don’t think we totally understand yet, but it’s also closing up things too, because we have only so much time per day to think and to absorb things and store things, and when we put something else, we’re replacing something else. So, one thing is replacing another. For instance, a lot of things, a lot of information we are getting is not from newspapers. We are getting it from the internet now. There are certain advantages to that, but there’s also newspapers…I’m from Cincinnati. My local newspaper had a whole staff of reporters who would hang around City Hall. They really got to know… there was a reporter on education, one on religion, a whole series of them. Now, this has so been cut back, and a lot of people don’t get the paper. A lot of these things from the local community no longer reach the people who live there. Caryn Hartglass: And people are looking, for the most part, for very select information. Peter Seidel: Yeah. That’s what you get on the internet, so the internet… what we’re doing is we are communicating, connecting more with people all over the world, and less and less with people who live right around us. Caryn Hartglass: Mm-hm. What’s the danger of that? Caryn Hartglass: That’s a loaded question. Peter Seidel: That’s a big question. I think it requires a lot of thought… a lot. It would take a lot of time to think about it and talk about it, so I won’t dare. Caryn Hartglass: Ok. So, let’s move a little further into this book. Now, what I really like about it is it was explaining… I don’t listen to the news all the time, because I find it’s very sensational, I find it’s very one-sided, I don’t find that it’s really “news.” A lot of time, I call it the “olds” because I’m hearing things that I knew about already! But I always get anxious; I get frustrated; I get disappointed, because I’m not hearing what I really want to hear and what happens is most people that are listening are kind of numbed and dumbed down into … like, one thought. Everyone’s getting the same information. We all have the same thoughts. Some of them are a little sided to the left and some of them are a little sided to the right, but we all start thinking about the same stuff, and most of it is so trivial. On the news, when they’re talking about makeup and fashion, and they’re not talking about poverty and hunger and environmental problems… how does this happen and why is this happening? And this is part of what’s in our human nature. Peter Seidel: That’s true. I listen to NPR while I’m preparing food and eating and so on. So I get a lot of information from that and an awful lot of it is about, as you could say, the latest this and that, and rock music or sports, or the latest thing that has been going on is the political campaign, which has been taking so much, so much time. And it’s all like a horse race: Who’s ahead? And not real substance. Caryn Hartglass: That’s right. No, there’s no substance. I like what you said later in the book… I don’t want to jump right into what we can do. I kind of want to save the good stuff for later, but you talk about maybe having an exam or something that politicians need to pass in order to qualify to be a politician, and that is a brilliant idea. Peter Seidel: Yeah. Oh, would they fight that though. Caryn Hartglass: Well, they fight everything. We shouldn’t have these Super PACs. It shouldn’t be just the rich who can run for office. Peter Seidel: I know. One thing is that politicians spend so much time campaigning. There’s an interesting quote in the book from Kenneth Boulding, economist, and he said, basically the things that qualify or enable people to run for office disqualify them from running for it. And that’s true, I think. They should be learning things and understanding how the world works and understanding… they should be learning something about science, because we don’t have enough people who… the people in all these places, they don’t have respect for science. Caryn Hartglass: You mentioned something about science that was intriguing to me, and I’ve been reading articles about some of it where a lot of the decisions we make, a lot of the work that we do is really tainted in some way by our own perceptions, and even science, that we want to think is true and pure, comes with a lot of subjectivity. There’s even been some articles talking about different studies that have been done and the results that they got and then later, they repeated the studies, and they have diminishing returns somehow, and this is related to the people that are doing the experiment, who think that they are really objective, still have some degree of subjectivity in anticipating some of the results. Peter Seidel: Always. A good scientist… to be any good, you have to be as objective as you possibly can and not put in any of your own wishes or thoughts or anything like it. And when results are come up with, all results in science are tentative. In other words, they all stand there to be ripped down if other evidence shows that this is not correct. This is something very important for people to understand about science: the law of gravity, if all of a sudden things started not falling down, it would have to be wiped out and we’d admit we were wrong. Basically, this is the way that good science works. People do objectively try to go through it and learn the truth, or learn reality (because what’s truth?) to get the evidence so they can get as much evidence as possible, and then it’s usually peer-reviewed, so it isn’t just one person comes up with something, but then they put it out. Then other scientists will go over the same experiments and do them, and if they don’t come up with the result, they come back and say that. Peter Seidel: This is the way it has to be. It’s all standing there, and it’s all waiting to be challenged. Caryn Hartglass: There’s a lot of ego involved, unfortunately, and you talk about the difference between being right and being correct, and how difficult that is for many people to not admit that they are no longer right! Peter Seidel: Yeah. There’s too many of us running around saying that we are right. Caryn Hartglass: Ok. So, we’re moving along in history, and we’re doing things left and right… You bring up different points in history. Certainly, Nazi Germany is a popular one because so many things went wrong there. Something that I always found interesting was the fact that Hitler wanted to be an artist, and apparently he wasn’t very good, and he didn’t do well enough to get into the art school that he wanted to go to. Peter Seidel: Wasn’t that a shame. Peter Seidel: It was a shame that he didn’t get in. Caryn Hartglass: Yeah. And look what happened as a result. We can learn so much from that and yet we haven’t. Individuals at a very young age should be encouraged to be creative, encouraged to be imaginative and encouraged to pursue the things that seem interesting to them, whether they are good at them or not. Peter Seidel: Well, sometimes when people are not good at things, I’ve taught architecture, and it’s not good to keep encouraging someone who has no ability or no talent for it. It’s better that they find something else for themselves to do… because in the end, if they are not good, they’ll be unhappy also with what they are doing. Caryn Hartglass: Sure. But maybe there is a nice way to do it, so that you don’t end up trying to wipe out a race. Peter Seidel: Yeah. Well Hitler had some other characteristics that were not so good. There are a lot of other people who couldn’t get into art school who didn’t do what he did. Caryn Hartglass: I’m really frightened about the future because of how we have limited our children in terms of imagination development, with television and just how children spend their time is more with… less with being creative and imaginative and more with taking in what’s being given to them. Peter Seidel: I know, and it’s becoming a special problem now with Facebook and Twitter and social networking. They spend so much time… I watched a program on public television about I think it was the “Digital Age” or something. In one place, it showed a class of students, I think they were at Harvard maybe, and they were all sitting in the lecture with computer screens and I thought, oh these guys are all taking notes. No, they weren’t. They were communicating with each other. Caryn Hartglass: Mm-hm. And they were probably one desk down from each other, right? Peter Seidel: Yeah. So the professor in front, he was standing there lecturing away and I think half the students didn’t hear what he was saying. Caryn Hartglass: Well, I’m going to admit that when I was in college back in the late 1970’s, I used to write little paper notes to some of my friends while the professor was talking [Peter: Oh dear.] and I didn’t catch all of it. So probably texting and working on a computer, communicating is probably not that much different. Peter Seidel: Well, you had certain limitations on how many of those notes you could send around. They don’t seem to have any limitations. Caryn Hartglass: Absolutely. I had to be really clever about passing that piece of paper… Your title, Invisible Walls, what does that mean? Peter Seidel: Well, it meant obstacles that we don’t see. In other words, there are things that are holding us back from doing what makes sense, and we don’t see what is holding us back. So the book is trying to explain what those things are. Caryn Hartglass: Yes, and you do such a good job doing it. For the most part, I felt… I want to say inspired, but I also felt comforted. Understanding really helps. It’s just like when people have emotional issues and they go to therapy or something and understanding their problem is like the first step in healing… that when we understand it, we can start to work towards making improvements. Peter Seidel: Yeah. One of the problems now is a lot more people need to understand those things. Caryn Hartglass: But the problem is so many people are numb, and so many people don’t care, and so many people are in their own worlds, and they are comfortable enough that the status quo is fine, while all this horror is going on around us. Do you think we can institute these changes before we really have to? Peter Seidel: Well, I think we already have to. In fact, I think we had to some years ago. Caryn Hartglass: Yeah. Thirty, forty years ago. Peter Seidel: Yeah. So I think we’ve got to do these things and the sooner the better and right now, on global warming… people, scientists and so on in the 350.org say we have maybe five years. If we don’t turn things around in five years, it’s going to be too late. Peter Seidel: Then we will start on a non-reversible plunge. So, if we look at where we are right now, it doesn’t look good at all. Caryn Hartglass: No. There are little pockets of people and organizations doing things, but it’s not enough. Caryn Hartglass: Yeah. Okay… I’m not going to worry about it right now. I just want to understand the problem and then do whatever I can to encourage everyone else to do whatever they can to do whatever we need to do to turn it all around. Peter Seidel: I think one thing that’s necessary is for people to know how serious our situation is. I think that has to get and then the people have to take it seriously. Then, from there, they can go on. First, people have got to see that we are in trouble. Peter Seidel: I haven’t. I would like to, somehow, but I’ve always got something else to do. Peter Seidel: I would really like to watch it to see what it is. Caryn Hartglass: I’ve watched a few shows, but only because I knew people who were on them, so that was my motivation. What’s really scary about it, okay, number one, reality TV really isn’t reality because they do a lot of filming and editors come along and edit clips to make a sensational story, and it can really change the way someone looks and appears in a story. But aside from that, these people… most of the time what makes one of these shows so interesting is that people do get violent, and people do get selfish and people do things that don’t benefit the group, that only benefit themselves, and what makes a lot of these shows really popular is that type of nature, which is frightening. Caryn Hartglass: Yeah. The one I’ve never watched is Survivor. I will not watch it, but little bits and things creep in every now and then, and you get a gist of things. For the most part, except for the one, I forget the name of it, where they build a house for a family in need, which is, you know, a nice story, most of them are very competitive, not cooperative, and they can get really violent and bring out the worst in people, which, in your book, you talk about how it’s in all of us: the best and the worst. Peter Seidel: Yeah. Without knowing what all this is, I can see one other thing that’s happening and that is people’s attraction to watching such stuff. Caryn Hartglass: Well, it reminds me of so many different things. In the Roman times, people used to watch these people go at each other and kill each other, and even as recent as here in New York City on Broadway, when Spiderman first came out and wasn’t doing very well, and different actors were having accidents, falling and hurting themselves, people were flocking there because they wanted to see something go wrong. Peter Seidel: Oh geez. I’ve been told that’s one reason that some people go to auto races. Caryn Hartglass: Yeah. Ok. So, I want to take a break, Peter, and come back, and we’re going to talk about all the good things that we can all do to make this world a better place. How about that? Caryn Hartglass: Ok, we’ll be right back. Caryn Hartglass: Hello, I’m Caryn Hartglass and you’re listening to It’s All About Food. I’m here with Peter Seidel, talking about his book Invisible Walls: Why We Ignore the Damage we Inflict on the Planet and Ourselves. Peter, when I asked you to do this interview, you were saying that your book wasn’t exactly about food, and I think it is all about food. Everything in your book certainly affects all of the systems we have in place that give us the food we have today, most of it which I don’t even think is food, which as a result is giving us the horrible wellness or sickness that so many people have today, and it’s all related to everything you talk in the book about corporations and politicians and doing things for profit and not for well-being. Caryn Hartglass: Yeah. Ok, so let’s talk about what we can do about it. There’s a number of different areas that we need to address. There are things we can do ourselves; there are things that we can really try and get our government officials to do, although that’s really rough, and then there are the ways we need to educate our children and ourselves. Caryn Hartglass: We don’t have time! Caryn Hartglass: We don’t have a lot of time! Peter Seidel: We don’t have time. We’ve got to change things fast. And one way I can see this is first of all, people have got to see how serious our situation is. Once when people… we have to get enough people to see and to care, and this is one thing that’s been falling apart because the time that I wrote the book I think there were more people that cared then than there are now. Caryn Hartglass: Yeah. You know what’s interesting? Your book was written in 1998, and then we had this catastrophic event on September 11, 2001 and you could almost say that you were predicting the possibility of something like that happening in your book. We had a great opportunity on September 12, 2001, and we really blew it. Peter Seidel: I think so. I wrote… I sent 50 op-eds and letters to editors, and what I suggested was several things. One thing, of course we had to go after the people who had done it and who were planning more things like that, but the others were: we have to figure out why these people are doing it and get to the bottom of it. What are the reasons? Why are these people doing this? Maybe there are things we can do to reduce this. And another thing, we have to make ourselves less more vulnerable. And what have we done? We’ve just made ourselves more vulnerable. Caryn Hartglass: More vulnerable. Yeah. You talked about something in the book, something that when I first heard about the concept, I felt a lot of peace, and that is the way things work on a microscopic and macroscopic level. So if we think about a living cell and how it combines with another cell and becomes a larger organism and then it combines with other similar size organisms and that whole group becomes a larger organism, and it goes on and on like that, and then we finally have plants and we have animals and people come together as a group and we have a village and a city and a nation. I found this to be beautiful. When I first read something that talked about this, I found that all of sudden life made sense to me. There was an order and there seemed to be an objective on the planet where we could all cooperate beyond borders and work together as one cooperative organism on the planet. Peter Seidel: Yeah. You just think, this world… we could all live wonderfully on it if we all put our minds to getting along with each other and the planet and live accordingly. We could be living wonderfully on the earth, but we can’t seem to live with each other, and we can’t seem to stop brutalizing the planet. Peter Seidel: If you think about all the things that are gone wrong, they are all basically caused by efforts of people to improve their own situation…gone wrong. Caryn Hartglass: Ok. So, I have this vision of what the world could be, and that’s nice, and we have a long way to get there, but I like to think that if enough of us amass could really realize what’s going on today, I think we could fix things pretty quickly. And the question is how do we get to that point? I don’t have that answer. I can just hope. Peter Seidel: I don’t either. But this is what we’ve got to do. Caryn Hartglass: We have to do a lot of talking, fast. Peter Seidel: Yeah. I think that people who know something, who care something, have to get out there and tell other people. Every year, I write a greeting to all the people I send Christmas cards to, and I put a lot of things in there. I tell what I think is… without waving my finger too much, of trying to make people aware of what’s happening. I think we have to tell people that. In the past, I was very meek about that. I didn’t want to turn all my friends and relatives off, but recent times I thought, my gosh, I better turn them on, or we’re not going to get to where we want to go. Caryn Hartglass: Yeah. It’s a really delicate place to be, because I don’t know who you are sending these cards to, but I’m imagining that many of them are rolling their eyes when they receive some of this information, unfortunately. Peter Seidel: I know it. Caryn Hartglass: But what I know is I’ve been talking about a lot of this, especially with respect to food because that’s where my passion lies, with many people for decades, and I’ve discovered that people need to hear this information over and over and over and over before the light goes on. Caryn Hartglass: And maybe that’s part of our limited brain… I don’t know. Peter Seidel: It is. We are that way. If there’s a nice play in town that sounds interesting to me, and I hear about it, I’m likely to forget about it, so they’ve got to tell me over and over a number of times until it really sinks in and I go. We are that way. Peter Seidel: Yeah. The trouble is, advertising people, of course, are making a living and they are performing a function for people who want to sell something, basically. So this is what they’re doing. I came across…I was in a library, sometimes I pick things up that are interesting… This was many years ago and I picked up Advertising Age, I think it was called. I started looking through it and there was a full page ad. On the ad there was a big line that went across and it went up, and what it said was that the number of times you repeated something, the number of times it improves the sale. In other words, if you double the advertising, the sales double. Caryn Hartglass: Money makes money. Peter Seidel: This is the way we are. Caryn Hartglass: Well, that says something about humanity, and I don’t really want to get all dark here, but are we really worth saving? Peter Seidel: Oh, I think so. Caryn Hartglass: Yeah, I think so too. Peter Seidel: I think we are the ultimate peak of the pyramid, of things that exist in the physical world. Caryn Hartglass: The thing is that those of us who are relatively privileged and have a job and have a home and can feed ourselves relatively well and have the opportunity to take a vacation and educate our children, and we work for some sort of company or business… it takes a lot of courage to speak out, to do something a little different, to say something isn’t quite right when everybody else is going in a different direction. Caryn Hartglass: Yeah, we can watch a movie, for example, and we love the whistle-blower; we love the hero who does that sort of thing, but most of us are not like that. Caryn Hartglass: Now, how do you live your life, if you don’t mind me asking that you think is beneficial for the planet? DO you have a certain lifestyle that you think might be helpful for others to emulate? Peter Seidel: What I do for myself is, and now I’m a pretty old kanucker… I am, I’m 85 [Caryn: Good for you!] and I’m a widower, so I’ve always thought, the idea of living like a monk has always had an appeal, and I will just devote myself to trying to write things about what I think, and try to utilize what I write in the best ways that I can, and this is what I do. I spend my time trying to do that, but it’s difficult for me, because really I’m a visual person. I’m an architect, a planner, and not a writer, but I write. Peter Seidel: Well, I try to say things very clearly and understandably, and then I have the help of a very good editor, and maybe because of my background, too. Architects and urban planners need to look at a whole picture, because in a building or a city, everything has got to work together, so you sort of look at all of this at once, and you see it. You see how everything is connected, inter-functions and affects everything else, and I think that this helps. So, that is the benefit, and then the difficult part that I deal with is writing. Caryn Hartglass: You mentioned in the book how so many of us are specialists now, and things have gotten so complicated and everybody knows their specialization, and as a result, we don’t have a good picture of what’s going on. Peter Seidel: Yes. This is one of the really big problems is the fact that we are all living in these little boxes with tunnel vision, and society rewards people who do that. Peter Seidel: Yeah, yeah. So many people are just doing their job. They know that what they’re doing, if they think about it, they can see that what they’re doing is not necessarily helpful. Caryn Hartglass: But they don’t want to think about it. Peter Seidel: But they do these things. There are scientists who develop nuclear weapons and rockets for North Korea. Caryn Hartglass: Mm-hm. Oh, goodness. Ok, well, I think it’s great that you’re doing what you’re doing, and you’re 85, and you’re writing, and you’re trying to make this world a better place. I think one thing that’s unfortunate in our society, and, especially as the economy is tanking in the toilet, we are not utilizing all the wisdom and knowledge that the older generations, 50 plus, have. So many people are losing their jobs and can’t find new jobs because they are considered too old, and yet they’re all very skilled, they’re all very knowledgeable, so we have this whole pool of stuff we are not working with. And then, we have another group of seniors who are just enjoying their lives and that’s fun, and they’re going to buffets and traveling around and enjoying their lives. That’s nice, but it would really be great if we could utilize all of this knowledge and talent. Peter Seidel: Yeah, it would be, and unfortunately too often there isn’t an opportunity given to people to be able to do these things. Peter Seidel: Also, like I think right now, all of us, I think everybody who does care and understands that we’re in trouble has to take it on themselves to expand this knowledge and concern. This is very important. Caryn Hartglass: I don’t like to paint a gloom and doom picture, although it looks pretty gloomy. Peter Seidel: It does. It does. Caryn Hartglass: I want people to know that the changes we need to make are not going to make life unpleasant. I believe they are going to make life better. People think they’re going to be deprived, that they are not going to have their comforts, and I think people will be happier. Peter Seidel: Oh, yeah. This is the interesting thing. We know a lot about, a lot has been learned about happiness, and they’ve tested people who win lotteries. They’re very happy at first but after about three months, they are exactly back where they were. And then we find that some people who have terrible diseases and handicaps, which of course are very upsetting at first, but after a while, they reach a level where they were about as happy as they were before they learned about this. And so, we have a certain level of happiness, and accumulating more stuff or refusing to give up things doesn’t have to do with that. The main things of happiness is that you have something that you feel… you’re doing something that you enjoy and that has worth; that you have good personal relationships, and these things, happiness takes care of itself. You don’t need all that stuff. Caryn Hartglass: Mm-hm. It’s not big houses and fancy sneakers and all different kinds of consumables that people think they really need to have. Peter Seidel: Yeah. In the book I mentioned about I was teaching in China, and the students in China lived in dorms that had no heat. There were no lights and they were in rooms, even graduate students were in rooms with six bunks. Six people in the bunks in one room where they studied, because at the time I was there, electricity was very scarce and the lights in the whole building would just go black at 10 o’clock so they couldn’t even study. There was no heat. The hallways, you had to feel your way around the hallways, and it was cold in winter. In China at that time, there were no elevators in buildings less than nine floors high. [Caryn: Oh!] But I found that these students were just as happy as students in the United States. Caryn Hartglass: Wow. It’s really fascinating. That’s something people need to know, that we can make this world cleaner, we can clean up our environment and we can be happier, or at least as happy as we are now, but I think a lot of people are not very happy. The last thing we didn’t talk about, which I think is an important piece of this equation and we just have a couple of minutes, is population, and obviously part of the problem is there are too many people on this planet. Peter Seidel: Absolutely. This is one thing that governments and people don’t seem to understand that as population goes up, well, there’s less of everything for everybody and the burden on the planet keeps going, and they seem to think that we can let it just keep growing and growing and growing, and the same with the economy. The economy has got to grow, and it can’t. Caryn Hartglass: Growth is not necessarily a good thing. Caryn Hartglass: It’s something that we can’t even visualize. It’s crazy. Well, we could go on about talking about this for a long time, but what I want to tell my listeners is to pick up this book Invisible Walls: Why We Ignore the Damage We Inflict on the Planet and Ourselves by Peter Seidel. It is…it is the book to read. All of our politicians should read it. Everyone should read it. Thank you for writing it and thank you for joining me on It’s All About Food. Peter Seidel: Thanks, I’ve enjoyed it, and I just might say that I wouldn’t change the book at all if I was writing it today. Caryn Hartglass: No, it’s right on, all of it. Ok, thank you. Peter Seidel: Ok, thank you so much. Caryn Hartglass: Ok, I’m Caryn Hartglass and you’ve been listening to It’s All About Food. Earth Day’s coming up this Sunday, which is also my birthday, and so, if you want to do something for me go to facebook.com Responsible Eating And Living and give us a like. That’s my non-profit and we could certainly use your support. The following week is Veg Week. Check out usvegweek.com by Compassion Over Killing; they’ve got a Veg Pledge thing going on. Lots of good things going on. I’m Caryn Hartglass. You’ve been listening to It’s All About Food. Have a delicious week!